Every child is born with its own, individual personality. My cute niece, Kelsey, had a giant personality with a little extra to spare! When she reached the toddler stage, she drew a lot of attention with her huge, brown eyes (and eyelashes that made grown women jealous) and a wide, toothy smile that lit up her whole face. Unless she was frowning. And when she was frowning, she was VERY, very serious. And when she was serious about something, she was feisty and extremely determined. Her parents, in an effort to help teach this spunky girl proper manners, taught her that certain words were “bad words” and shouldn’t be used. She had a baby brother and cousins to influence, after all. Part of the reason she was so alive and full of life, even at a young age, was that she was extremely intelligent. Her verbal ability far exceeded most kids her age. Certain words, such as stupid, dumb, and fart, for example, were banned from the family vocabulary. Not that these were terrible, awful words, but when you are tempted, like little children are, to include the phrase “you are” in front of “stupid”….well, that can be a problem at play group and other social settings. My husband, the always teasing Uncle, loved to egg Kelsey on. He knew the list of “bad words” and he knew that SHE knew they were bad. But whenever we were gathered at a family dinner at Grandma’s house, he couldn’t help himself. He would stand just outside a room where she was playing and call, “Stupid, stupid, stupid!” Kelsey would come storming out of the room, her two little hands on her two little hips, with a giant scowl on her face. In her most serious voice ever, she would give a true scolding to my hubby, “Uncle Ricky!!! THAT is a very bad word! We don’t say that word!” He would fake an apology and hang his head in shame. Kelsey would return to her playing. About 3 minutes later, Uncle Ricky would yell out again, “Stupid, stupid, stupid!” This game would repeat over and over and there was no giving in with Kelsey. She wasn’t frowning while hiding a grin. She was VERY serious about the whole thing. After several scoldings, she would shake her head a little at how “stupid” her Uncle Ricky was and seemed visibly surprised that he wasn’t catching on to the rules. 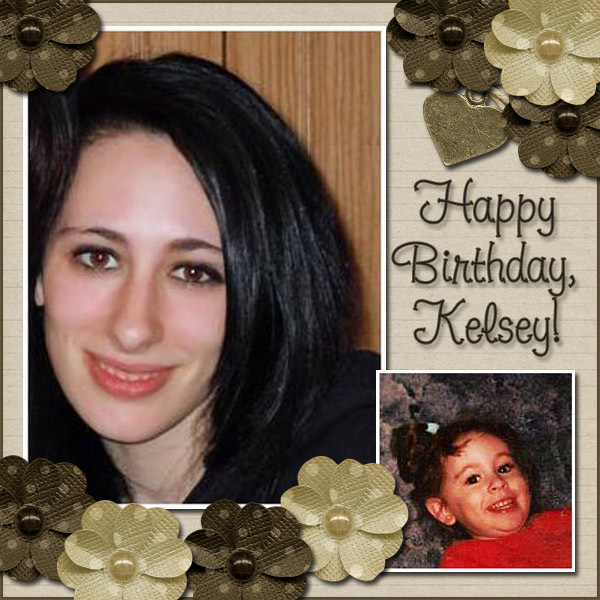 Kelsey was taken from us in January, as the result of a tragic car accident. And since her birthday is September 26, she has been on the minds of her family and friends, as she would be celebrating her 22nd year this week. The past 9 months have definitely been STUPID, STUPID, STUPID because we miss her so much and have had to deal so much loss, yet we are grateful for the cherished memories we have of her life. Thank you for sharing this! You have such a beautiful way of expressing the heartache that follows the death of someone we love. What a beautiful tribute to Kelsey!